Passerines, woodpeckers, warblers, jays…it was a truly a motley crowd that turned up at this watering hole for their routine rest and refueling on a warm Mediterranean morning. 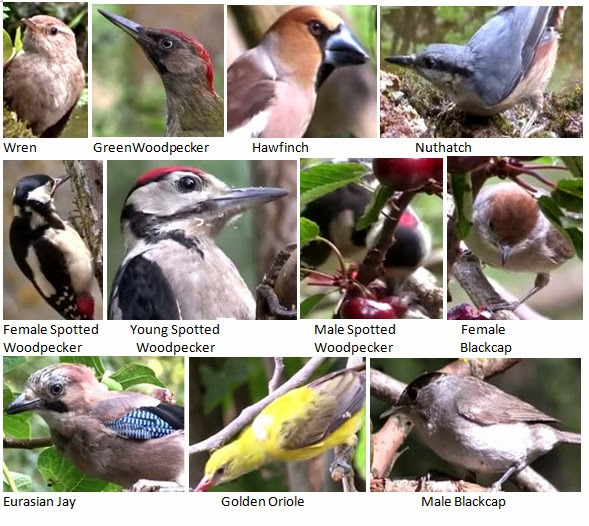 The frenetic avian activity was captured on film by nature and wildlife photographer and GOT member Pedro Rubio Garcia in the woods near the Catalan rural town of St. Agnés de Malanyanes, using a Canon XF300. The visitors that featured in Pedro’s video are, in order of appearance: 1-Wren, 2-European Green Woodpecker, 3-Hawfinch, 4-European Nuthatch, 5-female Great Spotted Woodpecker, 6- juvenile Great Spotted Woodpecker, 7- male Great Spotted Woodpecker, 8-Blackcap, 9-Eurasian Jay, 10-Golden Oriole, and 11-male Blackcap. Meeting fellow trekkers along the Grande Randonnée of the Catalan high mountains is already a rare event. But for weekend mountaineers Miriam Burballa and Paco Garcia nothing could have been more out of the ordinary than a face-to-face encounter with an imperious bird of prey high up the Matagalls, one of the highest mountains of the Montseny Massif, in Catalonia. (41°48′31.66″N 2°22′57.86″E). A leather strap attached to its leg and a transmitter fixed to its tail made it obvious that the raptor was a hunting bird of prey that’s lost its master. GOT ornithologists said it looked very much like a Saker Falcon, a prized falconry bird in the same league as the Peregrine Falcon and the hunting hawks. Feathers remained quite unruffled as the raptor, perched on a rock on the ground, allowed the intrepid mountaineers to approach almost within arm’s reach. But conscious of the risks, neither got any closer. Falconry is a hunting technique that involves breeding and training a raptor to capture prey in flight. In Catalonia, a licence is required and may be used only with captive species bred under strict regulatory control. All birds of prey are protected species. According to Wikipedia the falconer's traditional choice of bird is the Northern Goshawk and Peregrine Falcon. “In contemporary falconry in both North America and the UK they remain popular, although the Harris Hawk and Red-tailed Hawk are likely more widely used. The Northern Goshawk and the Golden Eagle are more commonly used in Eastern Europe than elsewhere. In the Middle East, the Saker Falcon is the most traditional species flown against the Houbara Bustard, Sandgrouse, Stone-curlew, Hares, and other birds. 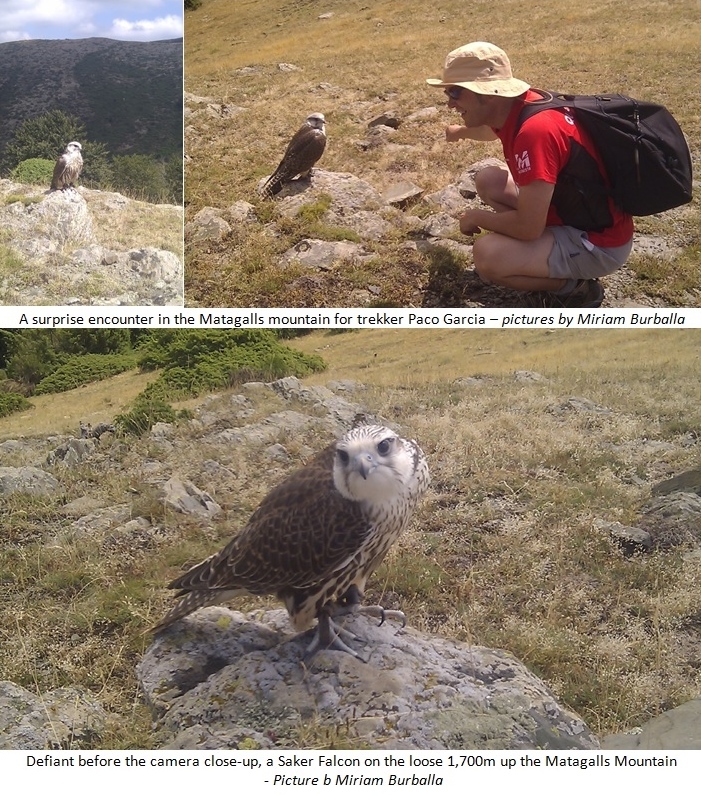 Peregrines and other captively bred imported falcons are also commonplace." Saker falcon, Falco cherrug, Halcón sacre, Falcó sagrat, Sakerfalke, Faucon sacre. The River Tenes (/'tenɜ:s/) is a secondary river running down the north-eastern region of Catalonia known as Valles Oriental (Eastern Valley). It originates at the confluence of the Castellcir and Torrent del Bosc streams (41 ° 44 ' 53.23 "N/2 ° 9 ' 34.77 "E) at 664metres above sea level and, after a relatively brief 32.50 km journey, spills into the River Besos 41º 32' 28.28"N/ 2º 3' 49.65"E at 57.6 metres above sea level. The Tenes Basin spans seven municipalities: Castellcir-Sant Quirze Safaja (el Moianès), Sant Feliu de Codines, Bigues i Riells, Santa Eulalia de Ronçana, Lliça d'Amunt, Lliça de Vall and Parets.